Do you want the best student clarinet, but you have no idea where to start? This short paragraph will offer you the information you need, in a nutshell. According to our extensive research, the Jean Paul USA CL-300 is the model you should pick. The ebonite body makes it a sturdy instrument. Because it is well centered and built with durability in mind, it is just the ideal choice for a student. Using the Boehm 17 key system, it is also easy to play. In case this model is no longer available, the Mugig B Flat is our next recommendation. One thing you will definitely love about this product is that it’s less expensive than it looks. Its performance also provides excellent value for the money, so, all in all, it is a good deal. The nickel keys and the ebonite body are designed to last, and any student will make great use of such an instrument. You will also appreciate that the model comes with all the needed extras, such as a carrying case, cork grease, a pair of gloves, and a cleaning cloth for easy maintenance. The case seems to be of a poorer quality compared to the clarinet itself. A complete pack with all the necessary extras, ideal for a student. Students who are just taking up clarinet as their instrument of choice will have a blast with this model from Mugig. The keys are plated with nickel, while the body is made from Bakelite, to give you an idea of the overall construction. Regarding performance, this model will make a great impression from the start. The bass sound is full and deep, the alto area is approached as it should, while the treble sounds are exquisite, as well. The reeds are not on par with the clarinet, some reviewers mention. 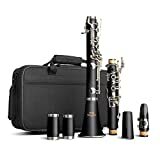 Anyone who desires a clarinet that is lightweight and easy to play will have a great time practicing with this instrument. The Gemeinhardt 2CN1 is a solid proof that you don’t have to go for a top of the line model to get a clarinet that looks great and plays great. The ABS body is durable, while the wood-like finish makes it look like a more expensive model. The undercut tone holes are one of the features that will convince you this is the instrument for you. The pricing is a bit expensive for an instrument intended for students. A lightweight model that will help all beginners start playing the clarinet. After reading the reviews of clarinets for students, we found several models that qualify for being listed as ideal for beginners. Due to their excellent features, they offer students the quality and reliability that are much needed. You get more than just a clarinet if you decide to purchase this model. One reason why so many people consider this an excellent option for students is that it comes with all the needed accessories. You will get a carrying case that will allow you to move your clarinet around with ease. You will also receive Rico reeds, a cleaning cloth, a pair of gloves, and cork grease. The ebonite body is adorned with nickel keys, and the overall first impression will be that this is a product worth the money. While it may look like a pretty expensive model, its low price tag makes it even more appealing to people who are just starting out. As it comes with the Boehm 17 key system, this instrument offers the user easy playability. The excellent response is one of the features that qualify this model for a recommendation for novices. A model that you will often find mentioned by the student clarinet reviews is the Mugig B Flat. Its overall durability and nice looks make it an excellent option for people who are just starting out. The body is made from bakelite, while the keys are plated with nickel. Construction and design aside, many other things will make you fall in love with this model. You will discover that the treble sound is loud and also clear. The pure tones you will be able to achieve in the alto area are something to write home about, too. Along these lines, we must also add that the bass zone is deep and full, as well. The manufacturer includes a carrying case that will allow you to move your instrument around with ease. Also, you will get a pair of gloves, a cloth for cleaning the pipes, grease for the cork, reeds, a cover cap, as well as other accessories that will help you maintain your instrument in top notch condition. As a beginner, you will discover that many of the instruments for sale cater to your needs. However, since you can only pick one, an excellent suggestion would be the Gemeinhardt 2CN1. Its ABS resin body is durable, lightweight, and inexpensive. To offer the illusion of a more expensive model, it comes with a wood-like finish. No one will suspect how much you paid for your clarinet. The fashionable design of this model makes it a hit with beginners. Made in the US, it complies with the highest quality standards and will offer you the possibility to play your favorite instrument as you desire. Created by expert clarinetists, it is a must-have for a beginner. You will notice the bore design with undercut tone holes; this is useful for obtaining various tonalities, which means that no challenge will be too much for you. The forged keys are plated with nickel, for a beautiful effect. If you are looking for a clarinet for beginners, look no further than this model. This clarinet is explicitly made for students, which means that practice will no longer be a challenge, but a pleasure. With an ebonite body and nickel keys, it looks beautiful and offers beginners the possibility to practice to their heart’s content. Buyers receive a hard shell case for carrying the clarinet safely to practice or gigs. The case also has a shoulder strap, and it can be attached to a backpack for even more comfortable transportation. With your purchase, you will also receive a mouthpiece, a cap, a reed holder, and no fewer than seven reeds, among other accessories. For maintenance, you will receive a cleaning cloth, a screwdriver, and cork grease. 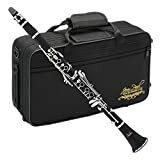 An easy to play clarinet, this model offers a student everything that is needed for practice and necessary maintenance, so, all in all, it is a great deal. Of all the clarinets reviewed by experts and users alike, the Jupiter JCL-700N stands out through specific particular features. Unlike other models that address the needs of beginners only, this one can be successfully used by intermediate clarinetists without a problem. First things first, the ABS resin construction ensures that the clarinet will not break easily. That is essential for a novice who cannot invest a lot of money in an expensive instrument. The material it is made from resists humidity changes, which is paramount for a durable model. You will notice the beautiful nickel silver keys, as well as the adjustable thumb rest, which is a nice extra. The tone produced is rich and full, and adaptable to various challenges. If you are looking for quality and durability in an inexpensive package, this model is excellent for you. A neck strap and a case are supplied with your purchase. When you are searching for musical instruments for beginners, regardless of whether you want student flutes or clarinets for beginners, there are certain aspects to bear in mind. The Bridgecraft WCL-GBK1 is made from durable materials while, at the same time, it doesn’t cost an arm and leg. The beautiful grain finish is one of the aspects that are worth mentioning, but not the only one. You will get, along with the clarinet, three reeds, a music stand, and a care kit. The deluxe carrying case looks beautiful, and you will also get a broad range of accessories that will make your purchase worth every penny. With everything you need at your fingertips, you will require nothing else. The care pack includes a cleaning cloth and cork grease, allowing you to maintain your clarinet in perfect condition. Created by a company with an excellent reputation for making musical instruments, this model is a good recommendation for novices. This clarinet is durable and has all the needed features that qualify it as an excellent buy for beginners. The black ebonite body, as well as the nickel plated keys, are durable, and justify the expense even if you are just a novice on the lookout for a new musical instrument. It is always ideal to purchase a musical instrument that comes along with many different accessories. If for a guitar, you might need to buy separately guitar amps, as well as other extras, many clarinets for beginners, like this one, come with almost everything. In this case, it must be noted that the model comes with a box of 10 reeds, which is more than most sellers offer. There are some other things included, such as two barrels, a mouthpiece, and a case for easy transportation. But, what counts as the icing on the cake is the foldable stand, and the pocketbook supplied with your purchase. Musical instruments are not always easy to pick, especially if you are just a novice and you don’t know where to start. We will focus, in this buying guide, on providing you with the necessary information to get the best clarinet for students that are currently available. The following considerations will narrow down your choices and give a good idea of what you want. Why should you get a clarinet with a body made of plastic? When you read the specs of a clarinet, you will notice that the manufacturer offers information on what kind of material is used for the body, and, in the case of most cheap student clarinets, that material will be ABS resin. This type of plastic is durable, so it prevents cracking and other damage. You may wonder, at this point, if it is a good idea to pick a model that is made with such cheap materials. The answer is a sound ‘yes’. What happens is that this plastic is specially engineered to serve its purpose, which is to be molded into the body of a musical instrument. You don’t have to worry that your instrument won’t sound like a clarinet. It will do precisely that. Also, the fact that your clarinet is durable counts as a sound investment. As a novice, you may not want to spend a lot of money on the instrument you will take with you at practice or gigs. There is another quality of this material that must be mentioned here. It does not suffer under temperature changes, and especially humidity variations. That means that you will be able to take your clarinet with you everywhere you go. What you need in a good student clarinet is durability. That means that you should aim for the best quality you can get without stretching your budget beyond reasonable possibilities. That being said, if the keys on your instrument of choice are plated with nickel or nickel silver, that is good enough for a beginner. It is the same rule that applies when you’re shopping for a saxophone for beginners. You must pay close attention to such aspects because they practically tell you what you must focus on. 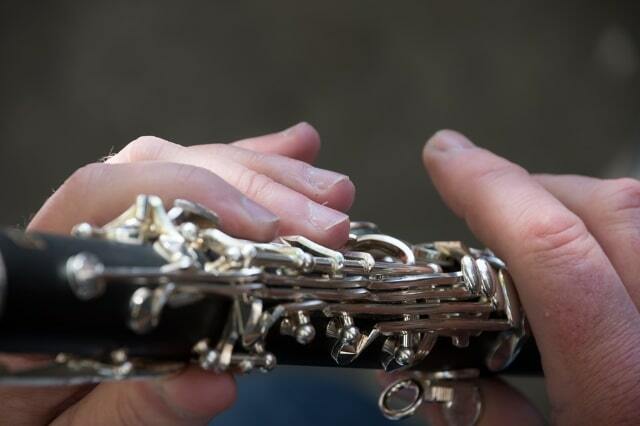 Durability is paramount for a clarinet you get for a novice, so go for nickel plated keys. Professionals even play on instruments with gold plated keys, but, until you get there, you should settle for something that is affordable. Are any reeds included with your purchase? As a beginner, you should pay extra attention to what comes along with the instrument you pick. One of the most important accessories is the reed. Depending on the type of reed you use, you can obtain a different sound, and that is something to bear in mind. Many clarinet manufacturers offer their clients a box of reeds with their purchases. There are a few notable reed manufacturers on the market, such as Rico, Selmer, and Vandoren. Rico is an US-based company, and that is why you will see many clarinet bundles including them, mainly if they cater to beginners. The strength and the cut of the reed plays a vital role in how your instrument sounds when you play. The hardness of a reed is rated from 1 to 5, the latter being the hardest. As a beginner, you will want to experiment with softer reeds first, as they are easier to use. The hard reeds, however, are responsible for a full, rich sound that you should aspire to achieve. What other accessories are included with your purchase? This is an important question, as manufacturers who cater to the needs of novices always strive to offer students some much-needed extras. Just like when you shop for a beginner drum set, you should always check the offer available, to see what it is included. We already mentioned reeds, but some other accessories should be included. For instance, a mouthpiece with ligature and cap is pretty standard, and you will also notice that some manufacturers also offer extra barrels. However, one item that will make your life easier will be a carrying case. For travel guitars and any other instrument you want to take with you on the road, you should have a case at hand. Some that are offered with a clarinet for beginners are molded to take the shape of your instrument and provide proper protection while taking up little space. Don’t forget that your clarinet needs some proper maintenance. That means that it is a good idea to get a bundle that includes a cleaning cloth, some cork grease, and other items that will help you care for your musical instrument to the best of your abilities.